If you run a business by yourself, you’re probably more hardworking than an average person. Hard work eventually brings your business to a new, larger phase. A good sign of growing bigger is when you have to call for another pair of hands to cope with your to-dos. Here’s to the subtle art of delegation. Different businesses need different assistance, but all employees have something in common. 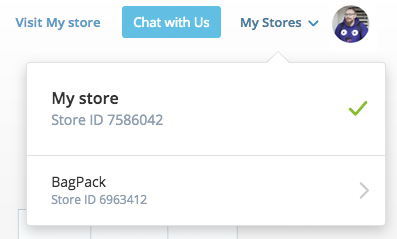 Designers, developers, operators, or marketers might need access to your Ecwid store backend to do their job. We have made it possible for you to invite up to two staff members on the Business plan and as many as you want on the Unlimited plan. They can get a special administrator access and log into your store with their accounts (emails). So you have decided to let someone else do a part of your online store management. Congratulations! But are you eager to share your login/password with this person? We know you’re not: you’ve created and grown your store like your own baby, so putting its security at risk is the last thing you want. Let your staff have their accounts with the administrator access to your store. That does more than just keeping your login and password safe. Your billing info. This means they can’t upgrade or downgrade your Ecwid subscription, or see your payment details and how many paid apps are connected to your store. It also means they can’t delete your store, as that requires downgrading it to the Free plan. Your Store Team page. Only you can invite, manage your team, and recall staff access anytime. 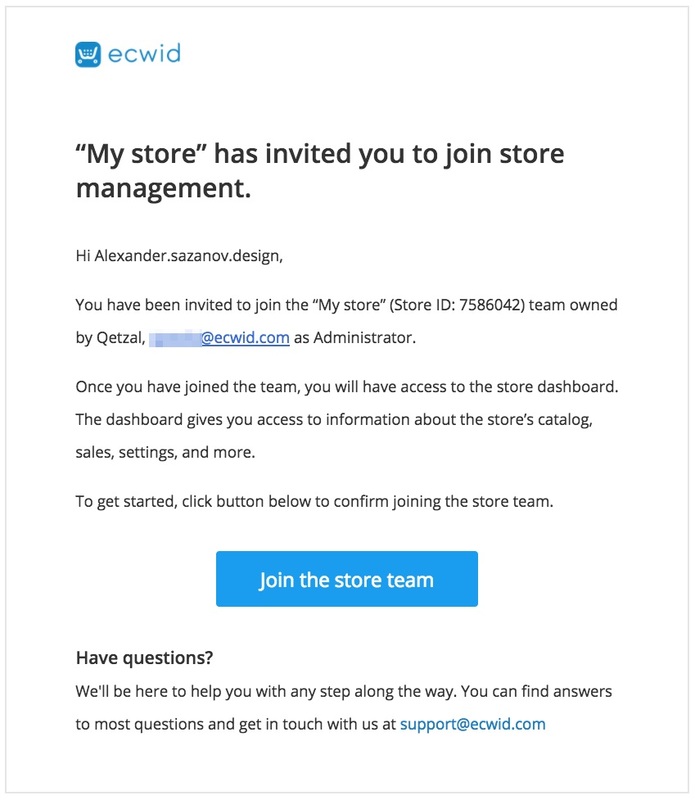 Here’s how to add new people to your Ecwid store team. Go to Control Panel → My Profile → Staff Accounts and click Add new team member. You’ll need the person’s email to do it. 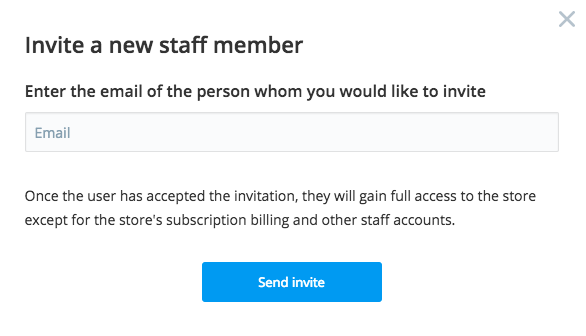 What happens after clicking the blue button depends on whether your staff are registered in Ecwid or not. If they don’t have an Ecwid account, they’ll get one with the administrator access to your store only. If they’ve already signed up for Ecwid, they’ll need to log in and choose a store to manage. I need to give different roles to my staff with different levels of access. Is it possible? In this release, you can only give Administrator access. It means staff can access your store, except for the billing page and the Staff Accounts page. We will add more staff roles in the future. What roles would you like to have in your store? Please don’t hesitate to share with us in the comments to this post or at blog@ecwid.com. I don’t have staff, but I own several Ecwid stores. Can I bundle them? Yes. Use the email address of store 1 to add it as an administrator to store 2. This way, you’ll be able to switch between the stores without logging in several times! You and only you can manage your team settings for your store in Control Panel → My Profile → Staff Accounts. Your staff members will only see their profile settings in the My profile section. Add new team members and delete those who don’t work for you anymore (e.g. freelancers). Navigate to the person’s card and click Actions → Remove. Your staff will get an email notification. No matter how large your team is, you can delegate work and let yourself focus on strategy (or simply get some sleep). Store managers: to manage sales, update product details, control stock. Fulfillment operators: to prepare orders for shipping, delivery, or in-store pickup. Marketing managers: to set up popups and banners, run promotions, add Facebook Pixel and Google Analytics. Developers: to adjust your storefront, change CSS themes, customize checkout. Designers: to set up your Ecwid store design, change color schemes, upload photography. Upgrade to the Business plan to invite two staff members and to the Unlimited plan to get an unlimited number of members on your store team. We’d love to hear back from you — share your feedback in the comments section below. This is just the first release of the Staff Accounts feature, and more is coming. Stay tuned!